American Arts & Crafts place soup spoons or dessert spoons (3) in the Town & Country pattern by Allan Adler. These handsome spoon measure 7 1/2" long. The excellent condition and crisp detail, with no monograms, removals, repairs or alterations, make this an especially attractive offering. The soft, warm, original finish is present, with no buffing or machine polishing. 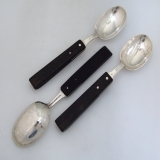 American sterling silver and ebony Arts & Crafts salad serving set marked RELDA by Paul Adler 1945-1946. This handsome set measures 10 1/2" long. The excellent condition and crisp detail, with no monograms, removals, repairs or alterations, make this an especially attractive offering. The soft, warm, original finish is present, with no buffing or machine polishing. 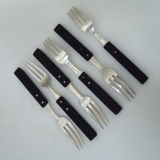 American sterling silver and ebony Arts & Crafts 4 salad forks in the Town & Country pattern by Allan Adler. This handsome forks measures 7 3/8" long. The excellent condition and crisp detail, with no monograms, removals, repairs or alterations, make this an especially attractive offering. The soft, warm, original finish is present, with no buffing or machine polishing. 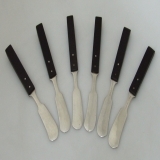 American sterling silver and ebony Arts & Crafts butter knives in the Town & Country pattern by Allan Adler. These handsome knives measure 7" long. The excellent condition and crisp detail, with no monograms, removals, repairs or alterations, make this an especially attractive offering. The soft, warm, original finish is present, with no buffing or machine polishing. 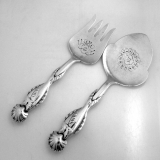 American sterling silver and ebony Arts & Crafts forks 6 in the Town & Country pattern by Allan Adler. These handsome forks measure 8" long. The excellent condition and crisp detail, with no monograms, removals, repairs or alterations, make this an especially attractive offering. The soft, warm, original finish is present, with no buffing or machine polishing. 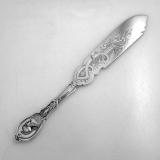 American sterling silver and ebony Arts & Crafts table spoon in the Town & Country pattern by Allan Adler. 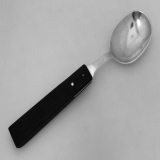 This handsome spoon measures 8 3/4" long. The excellent condition and crisp detail, with no monograms, removals, repairs or alterations, make this an especially attractive offering. The soft, warm, original finish is present, with no buffing or machine polishing. 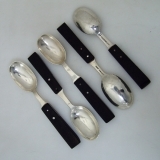 American sterling silver and ebony Arts & Crafts 5 teaspoons in the Town & Country pattern by Allan Adler. These handsome spoons measure 6 1/4" long. The excellent condition and crisp detail, with no monograms, removals, repairs or alterations, make this an especially attractive offering. The soft, warm, original finish is present, with no buffing or machine polishing. 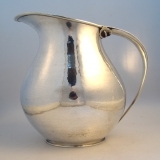 Arts & Crafts Movment inspired pitcher by master silversmith, William DeMatteo. It is sculptural and flowing, with an organic shape. It is superbly complemented with a single calla lily. Beautifully crafted c.1950 in Alexandria Virginia. This exceptional pitcher has an ice guard and is as useful and attractive today as when it was made. It weighs a hefty 751 grams and stands 9" inches, with a 5 1/2" diameter. The pristine condition and crisp detail, with no monograms, removals, repairs or alterations, make this an especially attractive offering. The soft, warm, original finish is present, with no buffing or machine polishing. 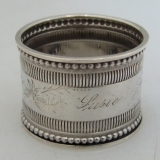 American coin silver napkin ring c.1880. This beautiful napkin ring measures 1 3/4" - 1 1/2" and weighs 15 grams or .5 ozs Troy. The excellent original condition and clear, crisp detail, with no removals, repairs or alterations, make this an especially attractive offering. Monogrammed Mother, the soft, warm, original antique finish is present, with no buffing or machine polishing. 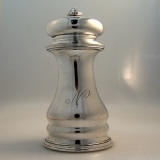 Italian 800 silver large peppermill having an all silver body and top. The large steel mechanism is in excellent working order and grinds the peppercorns to the desired coarseness set by the silver adjuster nut. This elegant and distinctive grinder is a generous 9 1/4" in height and weighs 495 grams or 15.91 Troy ounces. The weight includes the steel shaft and grinding gears, but the body is of substantial weight and there is no wooden interior. It has a mongrammed "N" which is done with classical scrolls. The exceptional original condition and clear, crisp detail, with no repairs or alterations, make this an especially attractive offering. The soft, warm, original finish is present, with no buffing or machine polishing. American Sterling Silver Stamp box in an elaborate Baroque design by George W. Shiebler, made for Tiffany & Co, both of New York City, c. 1890. This diminutive yet impressive Victorian stamp box has three compartments to hold the most frequently used denominations of stamps of the period. It features a gorgeous Baroque body with graceful intricate Repousse open scroll work , and is complemented by bead work borders on the edges of its body. It weighs 69 grams, or 2.21 Troy ounces. Quite substantial given its size of 3 1/8" in length and 1 1/4" in width. The impeccable condition and crisp detail, with no monograms, removals, repairs or alterations, make this an especially attractive offering The soft, warm, original finish is present, with no buffing or machine polishing. Majestic sterling tea and coffee set, masterfully created by Towle Silversmiths of Newbury, Massachusettes, Patented 1925. This regal and impressive suite is done in their elegant and famous Louis the XIV pattern. It features both tea and coffee pots, covered sugar bowl, creamer and waste bowl with a matching large oval tray or waiter. Each remarkable piece is enhanced by exquisite beaded borders and chased and engraved designs in classic floral motifs. This stunning set is complemented by artistic finials with graceful foliate designs. The pedestals rest perfectly flat, and reflect the superb beaded borders and refined embellishments of each extraordinary piece. Weighing a massive 4350 grams or 139.87 Troy ounces, the set is extremely substantial. The tray measures 23" in length, the coffee pot has a 4 1/2" diameter, and is 10 1/2" high. The tea pot has a 6" diameter and is 8 1/2" inches high. The wastebowl has a 5" diameter and is 3" in height. The sugar bowl is 5" in diameter and 6 1/2" in height. The creamer has a 3 1/2" diameter and is 6" inches in height. The impeccable condition and crisp detail, with no monograms, removals, repairs or alterations, make this an especially attractive offering The soft, warm, original finish is present, with no buffing or machine polishing. 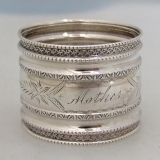 American coin silver napkin ring by Wood & Hughes, c.1885. This beautiful napkin ring measures 1 3/4" - 1 3/8" and weighs 18 grams or .6 ozs Troy. The excellent original condition and clear, crisp detail, with no removals, repairs or alterations, make this an especially attractive offering. Monogrammed Susie, the soft, warm, original antique finish is present, with no buffing or machine polishing. A magnificent Gorham sterling silver openwork fruit bowl, embellished with applied medallions, and draped with classical foliate boughs. 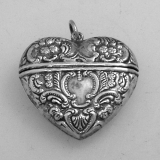 It was made by Gorham Silversmiths for American retailer, J.E. Caldwell, Philadelphia, in 1894. This elegant and substantial piece measures 12" in length, 9" in width and 5" in height. It weighs an impressive 620 grams or 19.93 Troy ounces. The exceptional original condition and clear, crisp detail, with no monograms, removals, repairs or alterations, make this an especially attractive offering. The soft, warm, original finish is present, with no buffing or machine polishing. 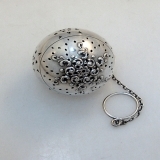 This charming American sterling silver tea ball is done in Websterâ€²s pattern # 18, c.1920. It features delightful little repousse scroll embellishment on either end and weighs 33 grams or 1.06 Troy ounces and has a 1 3/4" diameter. The impeccable condition and clear, crisp detail, with no monograms, removals, repairs or alterations, make this an especially attractive offering. The soft, warm, original finish is present, with no buffing or machine polishing. Danish sterling silver ornamental fish serving set in the 55 pattern by Georg Jensen, 1933-1944. 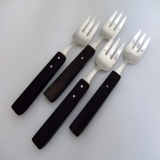 The serving fork measures 9" long, the fish knife is 9 3/4" long. The excellent original condition and clear, crisp detail, with no monograms, removals, repairs or alterations, make this an especially attractive offering. The soft, warm, original finish is present, with no buffing or machine polishing. 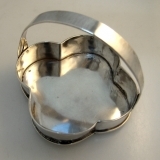 American Arts & Crafts sterling silver quatrefoil shaped basket, makers marks MPD, c.1940. This unusual basket measures 5 3/4" tall, 5 3/4" wide, 1 1/2" deep and weighs 396 grams or 12.7 ozs Troy. The excellent original condition and clear, crisp detail, with no monograms, removals, repairs or alterations, make this an especially attractive offering. The soft, warm, original finish is present, with no buffing or machine polishing. American coin silver Medallion Cake Saw by Albert Coles c.1865. This handsome cake saw measures 9 1/4" long and weighs 64 grams 2 ozs Troy. Monogrammed Turney, the soft, warm, original finish is present, with no buffing or machine polishing. 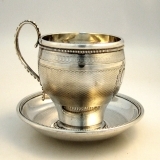 American coin silver engine turned cup and saucer made by Hyde & Goodrich New Orleans c.1860. Both cup and saucer have matching engine turned decorations, the cup has applied beaded border under the rim, applied twist rope foot, strap work handle with applied beads and beaded border under the rim of the saucer. This handsome set weighs 216 grams or 7 ozs Troy. The saucer is 4 3/4" in diameter, the cup is 2 5/8" tall, 4 1/4" across the handle. The excellent original condition and clear detail, with no removals, repairs or alterations, make this an especially attractive offering. Monogrammed Mary Keirn from her Grandmother Lucy Keirn, the soft, warm, original finish is present, with no buffing or machine polishing. American sterling silver Aesthetic baby cup Gorham date marked for 1874. This beautiful cup measures 3 5/8" tall, 4 1/2" across the handle and weighs 199 grams or 6.4 ozs Troy. The excellent original condition and clear detail, with no removals, repairs or alterations, make this an especially attractive offering. Inscribed Lilian, from Grandpa Waterman. Aug. 26th 1874, the soft, warm, original finish is present, with no buffing or machine polishing. American sterling silver repousse tea set with flower finials made by Stieff (early crown mark) c.1910. This beautiful and heavy set measure: Tea Pot: 8 1/4" tall, 9 5/8" across the handle and weighs 1022 grams. Sugar Bowl is 6 1/2" tall, 7 1/4" across the handle and weighs 656 grams. Creamer: 5" tall, 5 1/2" across the handle and weighs 335 grams. Total weight 65 ozs Troy. The excellent original condition and clear detail, with no removals, repairs or alterations, make this an especially attractive offering. Monogrammed PNB, the soft, warm, original finish is present, with no buffing or machine polishing. German 813 Standard silver Wax Jack with a chased twisted rope decorations, c.1750. This very unusual Jack Wax with the snuffer and chain measures 6 3/8" tall, 5" across the handle. The excellent original condition and clear, crisp detail, with no monograms, removals, repairs or alterations, make this an especially attractive offering. The soft, warm, original finish is present, with no buffing or machine polishing. 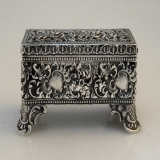 English sterling silver ornate salver or footed tray made in London in 1765 by Richard Rugg. This elegant, large salver features a field of original, flat chased floral, foliate and scroll decorations and has no monograms or inscriptions, with no signs of any removals. It sits on three cast ball and claw feet and has a cast, applied gadroon edge with a shell and scroll border. Dimensions: Weight: 37.4 ozs Troy Height: 1 Â¼" Diameter: 14" Maker & Marks: Richard Rugg London with a full set of Hallmarks for 1765. K; Lion Passant; Leopardâ€™s Head, crowned; Râ€¢R in a rectangle. Marked on the back of the tray. American coin silver Medallion melon serving set with male & female medallions on both sides of the handle and cast Kingâ€²s bust finial, made by Gorham Silversmiths c.1865. 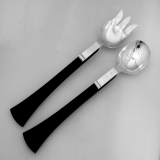 This phenomenal set measure: fork 8 1/8" long; knife 10" long, total weight 238 grams or 7.6 ozs Troy. The excellent original condition and clear, crisp detail, with no monograms, removals, repairs or alterations, make this an especially attractive offering. The soft, warm, original finish is present, with no buffing or machine polishing. American sterling silver double stamp box with hinged lid by Frank Smith c.1890. 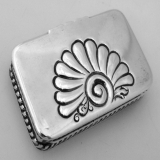 This beautiful box measures 2 7/8" long, 1 3/4" wide, 1/2" deep and weighs 74 grams or 2.4 ozs Troy. The excellent original condition and clear, crisp detail, with no monograms, removals, repairs or alterations, make this an especially attractive offering. The soft, warm, original finish is present, with no buffing or machine polishing. Richly detailed American sterling silver Repousse water pitcher in the elegant Rose pattern by Stieff Silversmiths of Baltimore, Maryland c.1920-1940. 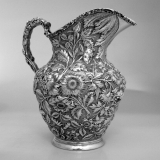 This exquisite pitcher is done in magnificent Repousse throughout. It features a large, flared spout and a lovely naturalistic grapevine handle. It stands an impressive 10" in height, measures 8 1/2" spout to handle and weighs an extremely substantial 992 grams or 31.9 ozs. Troy. The excellent original condition and clear, crisp detail, with no monograms, removals, repairs or alterations, make this an especially attractive offering. The soft, warm, original antique finish is present, with no buffing or machine polishing. 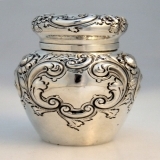 American sterling silver repousse tea caddy made for Black Starr & Frost c.1880. This beautiful tea caddy measures 4 1/8" tall, approx. 2 3/4" in diameter and weighs 142 grams or 4.6 ozs Troy. The excellent original condition and clear, crisp detail, with no monograms, removals, repairs or alterations, make this an especially attractive offering. The soft, warm, original finish is present, with no buffing or machine polishing. 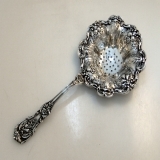 American sterling silver tea strainer in the Francis I pattern by Reed & Barton, newer mark. This beautiful strainer measures 7 3/8" long, 3 3/8" diameter of the strainer and weighs 72 grams or 2.3 ozs Troy. The excellent original condition and clear, crisp detail, with no monograms, removals, repairs or alterations, make this an especially attractive offering. The soft, warm, original finish is present, with no buffing or machine polishing.